After a short and restful retreat, big chungus are rolling into Premier with a larger-than-life team stuffed with veteran players. Heading the team is hertz, who last played for Jasmine Tea, winning ozfortress season 23 in a dominant fashion. He is joined on the Soldier class by rky, who achieved a respectable 3rd place finish in ozfortress season 23 with nefarious. The Soldier duo is backed by the Scout combo down and lau, the latter of which is currently on a four-season Prem win streak, with the prior having made playoffs last season with Trisomy 21. The roster is evened out on the scales by players enrith and lock, two more former Jasmine Tea players who have previously won the Premier division in previous seasons. 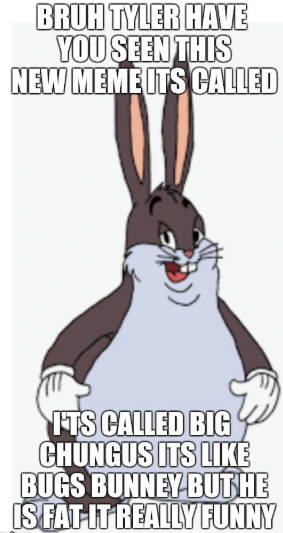 Valve would have given us 10 billion dollars for a major if we didn't have a team named big chungus. So sad. for people not invested in ozfortress this roster is ridiculously stacked. If you were (and people will inevitably) compare them to Jasmine they are potentially a much more solid roster. In terms of scout combo, roamer and medic I'd argue straight upgrades. down and lau are about as scary a combo of scouts can be; lau is plain and simple the best aimer I've seen in TF2 period. lock is individually one of the smartest and most mechanically skilled people I've ever played with. rky is unfair, he's like an anime character I don't get how but his power just scales to always be on another level of the people surrounding him, Australia hasn't got a reputation for fantastic roamers but rky has broken that curse. In terms of demo and pocket you couldn't find better replacements for geoh and Paulsen then with hertz and enrith, enrith is the only person who could contend with Paulsen for his strengths in maincalling and aggressive strategy, and whereas geoh had some of the best aim and dm in the country hertz is a super selfless player who's mindset lies solely in what his play can do to make his team's job easier. lamsfor people not invested in ozfortress this roster is ridiculously stacked. yeah but the team's called "big chungus"
Why is this thread a copy of the coffee clock thread and why has sage's post on that thread disappeared? [quote=lams]for people not invested in ozfortress this roster is ridiculously stacked. tohcaplease tell me if theres any mistakes, i'm new!! AUSTRALIA HAS A BIG CHUNGUS TEAM! ?